As a clothing designer, how can you be sure that your clients will love what you create? Silvia and Sabrina Scandar, the masterminds behind Sew Love, use the power of community-sourced fashion fanatics to submit and vote on their favorite pieces. Designers post their sketches online and receive input and tips from followers. 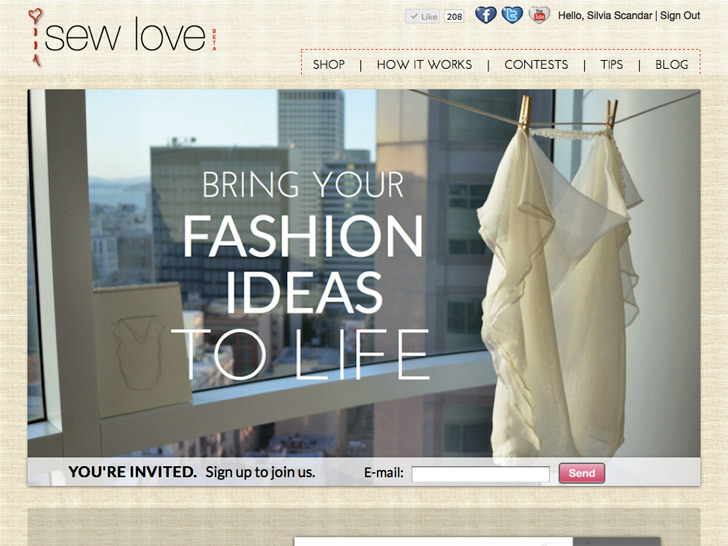 If the final drawing garners enough votes, Sew Love will create the product and make it available for sale. Designers receive royalties on each item purchased and exposure through the company. Started as a successful Kickstarter campagin, Sew Love hopes to embrace sustainability in their efforts to crowdsource fashion design. Sew Love may be one of the first online forums for designers to showcase their work that also incorporates sustainable production practices. The founders are committed to making most popular accessory of clothing ideas through companies in the United States from environmentally and socially friendly fabrics. Every month, three winning designs will be considered for production. One of their first pieces, the “Tulip” skirt by Patricia and Jeanette Delgado, will be produced in two limited edition versions. The first from French terry that is 37 percent organic cotton and 58 percent soy, and the second from handwoven raw silk that is manufactured at a rate of only four yards per day. Siliva and Sabrina Scandar are also working in collaboration with Boston-based nonprofit Project Repat, an organization that upcycles discarded and excess clothing into new pieces. Together they have launched a handbag design contest running through October 15 that challenges designers to make purses from excess materials. Submissions are already pouring in and displayed on the Sew Love site. As a clothing designer, how can you be sure that your clients will love what you create? Silvia and Sabrina Scandar, the masterminds behind Sew Love, use the power of community-sourced fashion fanatics to submit and vote on their favorite pieces. Designers post their sketches online and receive input and tips from followers.�If the final drawing garners enough votes, Sew Love will create the product and make it available for sale. Designers receive royalties on each item purchased and exposure through the company. Started as a successful Kickstarter campagin, Sew Love hopes to embrace sustainability in their efforts to crowdsource fashion design.